Greetings from Scottsdale! Thomas and I are out here for Spring Training, and we’ve had a very interesting time so far. We’ve seen two games, one loss and one tie, and done our best not to melt in the desert sun. – We talked to Willie McCovey. He’s very impressed by the new outfielders, but especially Melky Cabrera. We saw him call Melky over and introduce himself and shake his hand. Melky went 0-3, but I’ll give McCovey’s judgement the benefit of the doubt. 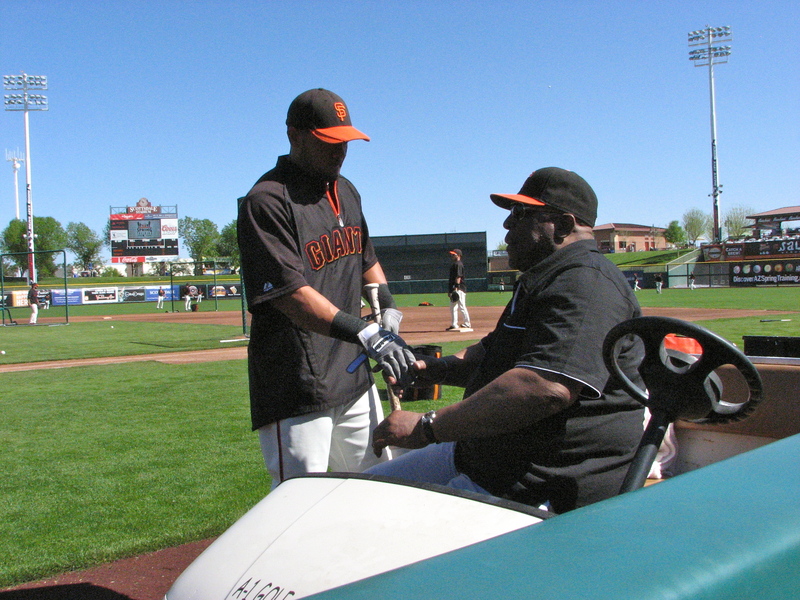 Also, we talked to Willie McCovey. 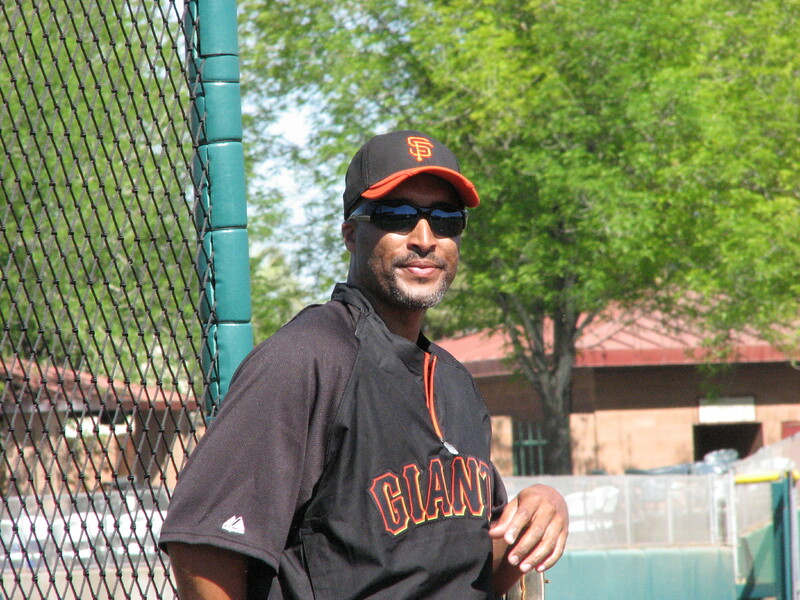 "Hi Melky, my name is Willie McCovey." – Today’s game was pretty slow offensively, if you can believe it, with good pitching. Matt Cain gave up two runs and gave up some solid contact, but threw 48 strikes on 71 pitches. At this point it’s more about getting his pitches across the plate than avoiding bats. After that, Mitch “who?” Lively, Brian Wilson, Javier Lopez, Clay Hensley, Brian Burres, Dan Otero and Jean Machi combined for 6.1 shutout innings. 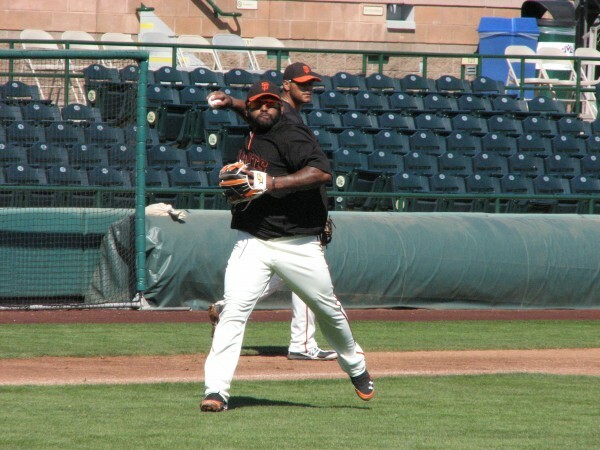 – I wish I had predicted more loudly two weeks ago that Gregor Blanco would make the team, because it seems more and more likely now. He walked in the first inning, then motored from first to third on a Melky groundout, then scored. Dude’s fast, takes initiative, and can fill several roles. When asked about Blanco as a fourth outfielder, Bochy said “Great starter too.” He made no promises, but likes what Blanco can bring to the club with his speed and defense. 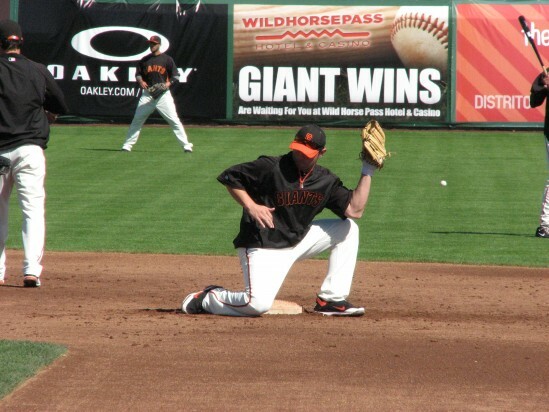 – For some reason, our video camera recorded Bochy sideways, so sorry about that. – Buster Posey is tired of answering questions about his health. – Matt Cain is tired of answering questions about his contract. – We watched Freddy Sanchez take grounders. He was able to make the throw to first, but it seemed a little below top speed. Bochy said he may take infield practice tomorrow or the next day, but they’re taking it really slow with him. – Cubs fans really seem to care about Spring Training. They showed up in force at Giants stadium on Tuesday, and even threw back a home run that Anthony Rizzo hit, despite the fact that Rizzo is on the Cubs. Moral of this story: Cubs fans are both passionate, and can’t tell the difference between black and blue.